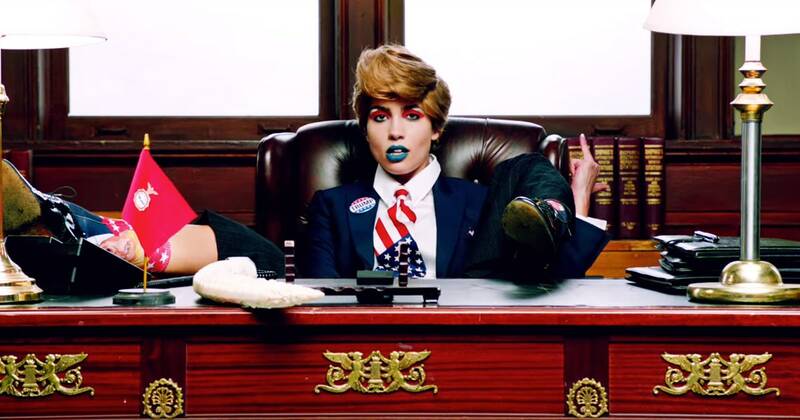 In this video, Tolokonnikova intersperses actual clips of Trump speeches and rallies with some horrifying, dystopian Nazi imagery, and intense scenes visually playing out the violence on female bodies that Trump has already promised with his words. “When I see Trump, I see my prison boss,” Tolokonnikova says of the video, referencing her 2013 imprisonment. “I see my prison official. I see in his face, in his gestures, in his words, that type of dude who humiliated me throughout my life, and I don’t want this kind of person to be the head of country.” It’s that juxtaposition of personal and state misogynistic violence, enacted through Trump lookalikes in border police uniforms, that comes through powerfully in the video.